Clemson, S.C—The Clemson Football Program has been nominated for four ESPY Awards according to a network announcement on Wednesday. 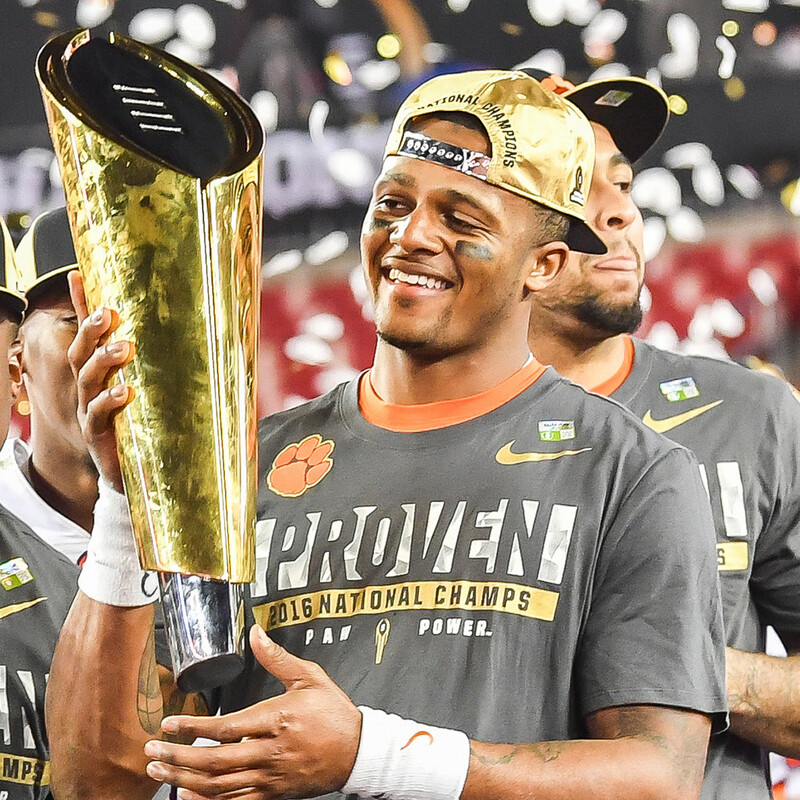 Clemson won the college football national championship last year with a 35-31 win over defending champion Alabama behind quarterback Deshaun Watson, who is nominated for two individual awards. The show will be held in Los Angeles, Calif., on Wednesday, July 12 and will be televised live on ABC starting at 8 p.m. Eastern time. The Clemson team has been nominated for the categories, “Best Team” and “Best Upset”. Clemson is in competition for the “Best Team” category with the Chicago Cubs, the New England Patriots, the Golden State Warriors, the Pittsburgh Penguins, the US Women’s Gymnastics Team and South Carolina women’s basketball. Clemson’s win over an Alabama team that had won 26 consecutive games is a finalist for “Best Upset” with Mississippi State’s NCAA Tournament win over UCONN and Denis Istomin’s Australian Open win over Novak Djokovic. Watson has been nominated for “Best Championship Game Performance” and “Best Male College Athlete”. Other candidates for championship game performance are Tom Brady of the New England Patriots, Shay Knighten of Oklahoma in the Women’s College World Series, and Kevin Durant of the Golden State Warriors in the NBA Championship series. Other candidates for the top male college athlete are Ian Harkes, Wake Forest soccer, Frank Mason, Kansas college basketball, Matt Rambo, Maryland lacrosse and Zain Retherford, Penn State wrestling. Clemson won the National Championship this year with a 14-1 record, tying the FBS mark for wins in a season. Clemson won the title despite playing the nation’s toughest schedule according to the NCAA, just the sixth time since 1977 that a national champion played the most difficult schedule. Clemson had wins over the No. 3, 2 and 1 teams in the nation and beat six teams that finished the season in the top 25. Watson completed 36-56 passes for 405 yards and three touchdowns against Alabama’s No. 1 ranked defense. He also rushed for 43 yards and a score. He completed a two-yard scoring pass to Hunter Renfrow with one second left to give Clemson a 35-31 win over an Alabama team that had won 26 in a row and had been ranked No. 1 nationally all season. Fans will have the chance to select the winners by voting online or via mobile at ESPN.com/ESPYS. Follow the official @ESPYS Twitter page and Tweet about your nomination and the ESPYS leading up to and during the live show. When you tweet, be sure to tag @ESPYS so that your tweets connect to the show. Then on the day of the show, Wednesday, July 12th, use #ESPYS in your tweets to join the conversation. The ESPYS and related events benefit the V Foundation for Cancer Research in memory of the late Jim Valvano. At the first annual ESPYS back in 1993, Jimmy V accepted the Arthur Ashe Courage award, reminded us to live each day to the fullest, and asked for our help in raising money for cancer research. Keep his dream alive by telling fans to #BeInspired.